All times are in KST. Step 1) To go following link http://user.interest.me/common/login/login.html?siteCode=S21&returnURL=http%3A%2F%2Fmwave.interest.me%2Fmcountdown%2Fmain.m to log in. Step 2) Enter log in details and click "Sign in" button to log in. Step 3) Go to voting page. Step 4) Look for and select After School and click the "VOTING" button to vote. Voting is from Friday 11:00am to Monday 9:00am. You can only vote once with one account. You can only vote 10 times per IP address. That means you can vote a total of 10 times a day on the same computer if you have 10 accounts. Step 5) Depending on what is shown on the MWAVE page(the page can be inconsistent) there are 2 paths that can be taken to get back step 2 to vote again with a different account. Step 5.1.0) If you are shown this then simply click the "Log in" button and log in again with a different account. 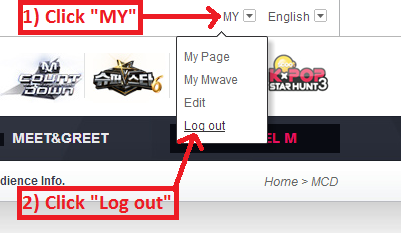 Step 5.2.0) If you see a "MY" menu instead of "Log in" link then open the menu by clicking on it and select "Log out". 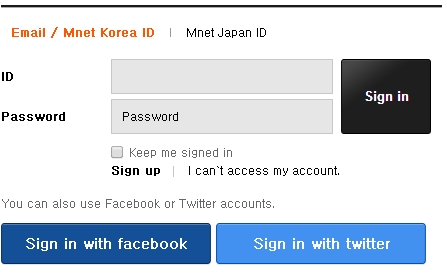 Step 5.2.1) Then click M COUNTDOWN icon.